December weddings are stunning. They are such a unique event that really does happen only once a year, and that is why they are one of our absolute favourites. There are so many lovely details that come out in December weddings. We love the deep, dark hues that can be seen appearing here and there. The drama of darker bouquets and floral displays, as well as the elegance of deep coloured bridesmaid dresses, get to us every time. We also adore the use of candles in any aspect of a wedding day; from a beautiful candlelit ceremony to tall pillar candles being the centrepiece of each table. They are incredibly dramatic and elegant and yet keep the cosy atmosphere of the season. The most iconic aspect of any wedding is, of course, the dress. One trend that we love to see over the Christmas period is the “wrapped up bride”. The use of a beautifully bright shawl or a fur coat to keep the winter chill away looks like something from a fairytale when paired with a wedding dress. We’re thinking Little Red Riding Hood, or perhaps the Snow Queen from Narnia. Equally, we love when a bride uses Christmas as a chance to embrace sparkles on a magnificent scale. Whether it’s sparkling embroidery on a dress, crystals on a veil or glitter just on the shoulders leading to a beautiful cape, we can’t get enough of it. It completely embodies the idea of a real-life Christmas fairy and when paired with falling snow, there is nothing more magical. 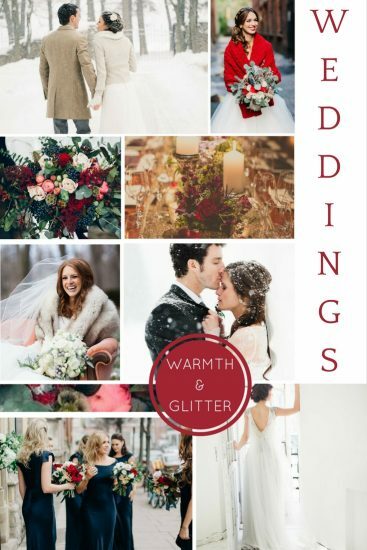 What are your favourite details for a December wedding?